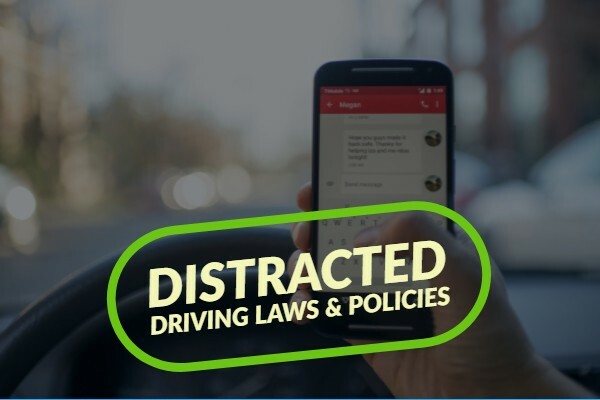 In this post, we will look at distracted driving laws around the world, sample distracted driving policies in fleets, and finally new anti-distracted driving technologies. If drinking and driving awareness was the 20th century trend, then distracted driving awareness should be the 21st century trend! Many countries got the same memo and passed distracted driving laws. Canada: Canadian distracted driving laws vary by province. For example, Ontario recently toughened laws by adding a license suspension on top of a traffic ticket for distracted drivers. US: Similar to Canada’s laws, cell phone laws vary by state. For instance, many states ban cellphone use while some states only ban cellphone use for new drivers. Europe: Like North America, many European countries have strict laws. 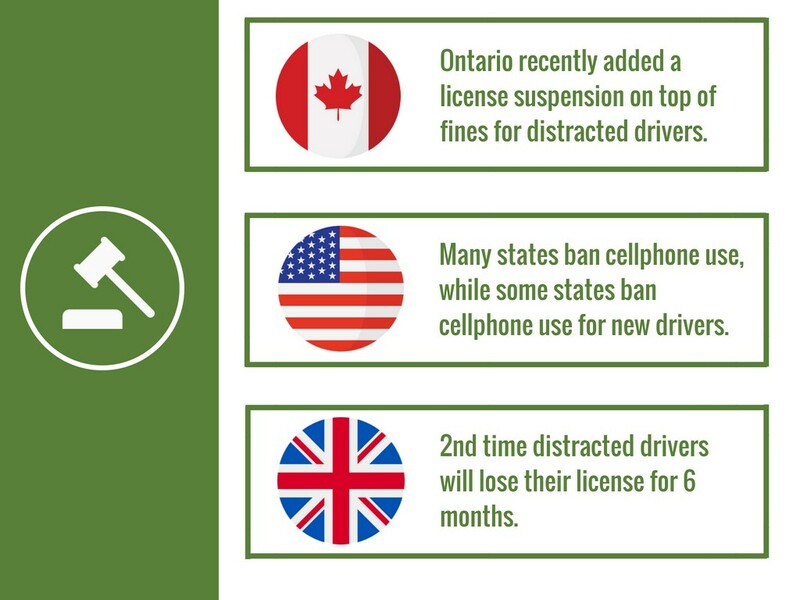 In the UK, your second distracted driving ticket leads to a 6-month license ban. Clearly, many countries agree on having anti-distracted driving laws. The biggest challenge, like any laws, is enforcing the rules. Unfortunately, even with steep penalties, a lot of drivers still refuse to put down their phones. Perhaps a good case study is to look at how some fleets enforced their distracted driving policies. 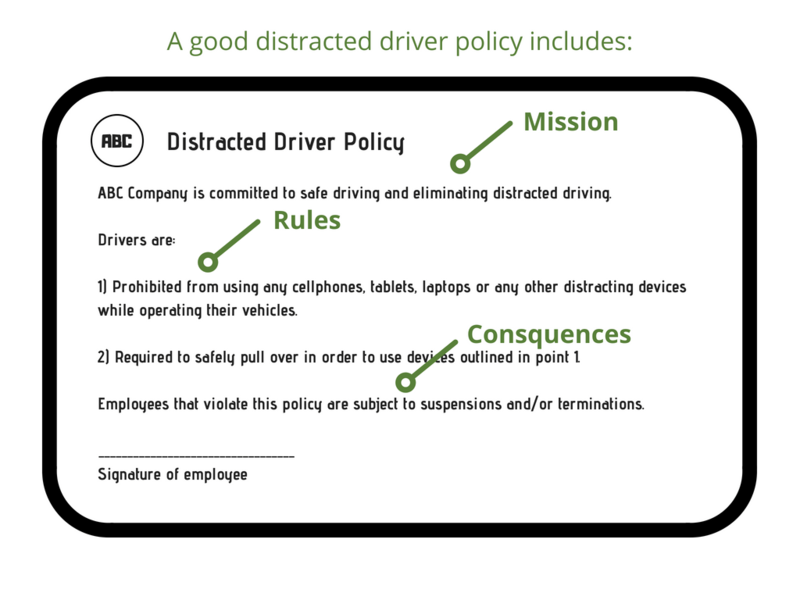 By 2018, most fleets have their own distracted driving policies. Some of the steps to implementing an effective policy include creating a policy, educating drivers on the policy, and enforcing the policy. A mission statement to describe the objective, such as “providing a safe service”. Rules to define how drivers must behave. For example, one business wrote that “drivers must not use cell phones while operating vehicles and must pull over to use their phone”. Finally, there should be clear consequences for breaking the policy. After creating the policy, businesses must then educate stakeholders. There are two typical ways to educate drivers – formally and informally. Formal education means company-endorsed events. For example, drivers should sign an agreement or managers should conduct distracted driving awareness workshops. Informal education, on the other hand, are non-official but equally effective initiatives. For example, it might include company drivers who become role models and speak out against distracted driving. Finally, the biggest success factor is being able to enforce distracted driving rules. Two common ways to enforce rules include: Reporting system. A reporting system is when supervisors react to reports. Reports might include traffic tickets, public complaints, or camera footage. Prevention systems. A prevention system is when supervisors prevent drivers from using phones. Some in-cab technology block cell phone use and prevent drivers from using their phones. On a concluding note, anti-distracted driving technology growth is also matching cell phone technology growth. Distracted drivers that take their eyes away from the road for over 3 seconds. Fatigued drivers that are closing their eyes or slumping forward. Similar to how people stopped drunk drivers with ignition locks, new technology and ideas are stopping distracted drivers!